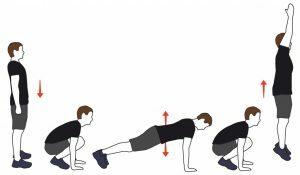 When performing burpees, the key is to perform them in quick succession in order to get the conditioning benefits this exercise is famous for. Add a Pushup to make them Harder. Lie on a bench or floor with a dumbbell in each hand. If you use a bench, you may have the feet up on the bench or on the floor, whichever is comfortable for bench height and your body and leg length. Position the dumbbells at the shoulders with upper arms at about 45 degrees to the body, have elbows forward of the shoulder line to avoid stress on the shoulder joint. The palms should face forward. Brace the abdominal muscles, tilt the chin slightly toward the chest and ensure you are in a stable and comfortable position. You’re ready to lift. 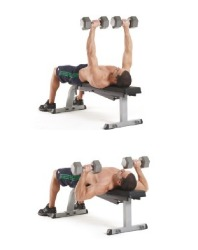 Chest Press Body Movement: Push the weights upward, taking care not to lock out the elbows in an explosive movement. The weights should follow a shallow arc and almost meet over the top of the chest. It’s okay to straighten the arms as long as you don’t do it with sudden or explosive force. This can injure your elbows. Try to move the weights in a controlled, smooth and not-too-fast lift. The head or shoulder blades should not rise off the bench. Lower the weights, muscles contracted, controlling the return to the starting position. Grab a dumbbell in each hand with a secure grip and let your arms hang naturally down at your sides. Slowly curl the dumbbells simultaneously up to the top. Set up for the triceps kickback by grabbing a flat bench and sitting a dumbbell on the left hand side at one end. Position yourself on the left side of the bench with your right knee and right hand resting on the bench. Using a neutral grip, pick up the dumbbell with your left hand. Keep your back straight and look forward. Tuck your left upper arm close to your torso and bend at the elbow, forming a 90 degree angle with your upper arm and forearm. This is the starting position. 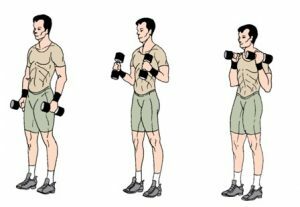 Moving only at the elbow, raise the dumbbell behind you until your arm is fully extended. Pause, and then lower the dumbbell back to the starting position. Repeat this movement for desired reps and then repeat using your right arm. Hold a pair of dumbbells at arm’s length next to your thighs. Start in a strong athletic base, feet hip-to-shoulder-width apart with a slight bend in your knees. Next, swing the dumbbells behind you while pushing your hips and hamstrings back as far as you can. Do this until your trunk is parallel with the floor while keeping your knees soft and a slight natural arch in your back. (You should feel a stretch in the backs of your thighs.) Explosively thrust your hips forward and come to a full stand, squeezing your gluts at the top of the movement. At the same time, swing your arms forward until they’re in front of your chest. That’s 1 rep.